We suggest here three exercises consisting in examining spectra of different sources of light, which can be done with use of your spectroscope. To do the exercise you will need a sheet of paper and something to write with, in order to put down the results of your observations. The spectra can also be photographed, but for the purpose of this exercise, a sheet of paper, a pen and possibly coloured felt-tips shall be just fine. 1. Observation of spectra of different sources of light and comparison of observation results with provided examples. This allows to identify different types of light bulbs - classical, energy-saving, fluorescent lamp. 2. Identification of the observed spectrum lines in emission spectra. 3. 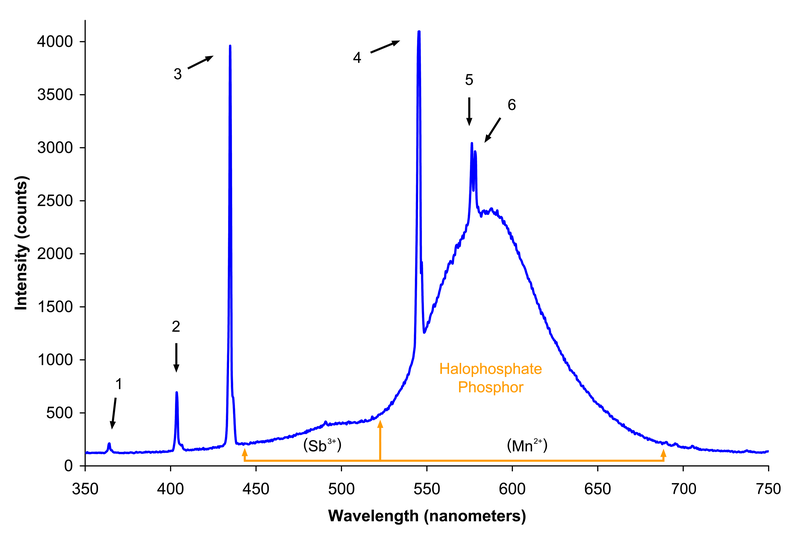 Observation of a yellow spectrum line of sodium. 4. Observation and identification of absorption lines in a spectrum of sunlight. Part I: Observation of spectra of different light sources. Point your spectroscope at different sources of light in your environment: light bulbs in your flat, street lamps, neon signs advertising shops and goods. Draw each observed spectrum and compare it to the spectra presented below. Does any spectrum match an exemplary one? If so, which of the examples? Below you will find photographs of spectra of different sources of light made with use of a home-made spectroscope and a digital camera. Your task is to compare spectra seen by you after pointing your spectroscope at light bulbs and lamps in your neighbourhood, with provided examples. For that purpose, it is recommended to print an image of a continuous spectrum and then draw on it a position of the observed spectrum lines. Spectrum no. 1 - a classical bulb or a halogen bulb. Spectrum no. 2 - a fluorescent lamp of the old type. Spectrum no. 3 - a fluorescent lamp of the new type. It has a richer spectrum and its light is more like sunlight. Spectrum no. 4 - an energy-saving bulb. Discuss conclusions drawn from your observations with your classmates. Have you succeeded, basing on the spectrum, in defining what sources of light can be found in your neighbourhood? If you find a lamp whose spectrum differs from the ones presented in this exercise, you can search spectra of different lamps in the Internet. 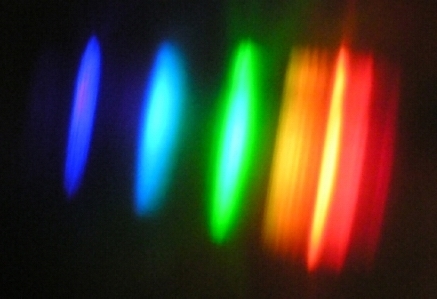 Thanks to observation of different sources of light by a spectroscope, we have learnt that light from some sources is not of a continuous character, but it is composed of clear spectrum lines. Spectra of emitted light are a kind of IDs of elements and particles. Each element and each particle has its own characteristic spectrum. Spectra are divided into emission ones, created when light is emitted by elements, and absorption ones, associated with absorption of light. If you find the spectra of elements interesting, we recommend you to visit Java animation illustrating spectra of elements. Apart from a spectroscope, you will need a candle and some salt to do this exercise. Fig. 2: A spectrum of a candle with a salted wax. An orange sodium line is clearly visible. Think about a chemical formula of a table salt. Does it contain sodium? Warning! Be extremely careful not to bring about fire! Part III: Emission Spectra - Identification of Spectral Lines. Through analysis of light of distant stars with use of especially construed spectroscopes of extreme sensitivity, the astronomers not only examine a chemical composition of a star but can also estimate age of a star, odkryć extrasolar planetary systems or evenmeasure the mass of a ditant galaxy. Print an image of a continuous spectrum and draw on it location of spectrum lines in spectra of lamps observed with your spectroscope. 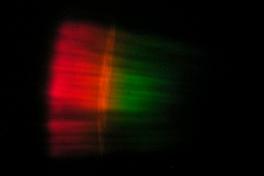 Below you will find some information on wavelength corresponding to emission lines in spectra of different lamps. As you can see, it is a simple spectrum, so you should have no problems to identify spectrum lines. Moreover, all spectrum lines in visible light come from one element - mercury. Spectra of modern fluorescent lamps are much more complicated, because they shine with light similar to sunlight. Such spectrum has more lines, which makes an identification more difficult. I. compare spectrum observed by you with a picture of a continuous spectrum (Fig. 1) and check as precisely as possible which wavelength corresponds to each spectrum line. II. try to identify the spectrum, that is to ascribe it to a particular type of a lamp. To achieve it, you have to compare location of the observed spectrum lines with location of spectrum lines of different lamps, by means of determined wavelengths of different spectrum lines. Beware of different scales in different figures! V. when you have completed your exercise, compare your results with your classmates. Part IV: Observations and Identification of Absorbtion Lines in a spectrum of sunlight - Fraunhofer lines. To observe a spectrum of sunlight, you must build a spectroscope with a long tube. The longer the tube of a spectroscope, the better resolving power and the less significant influence of imprecision resulting from slit making. 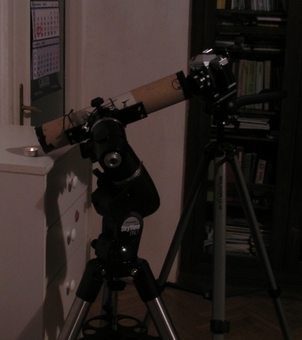 This exercise is based on observations with a spectroscope made of a 1-meter tube. Such tubes are easily accessible in the Internet and are quite cheap. WARNING!!! Under no circumstances you should look at the Sun, because you can damage your eyesight. It is not necessary to look directly at our daily star, in order to observe its spectrum. 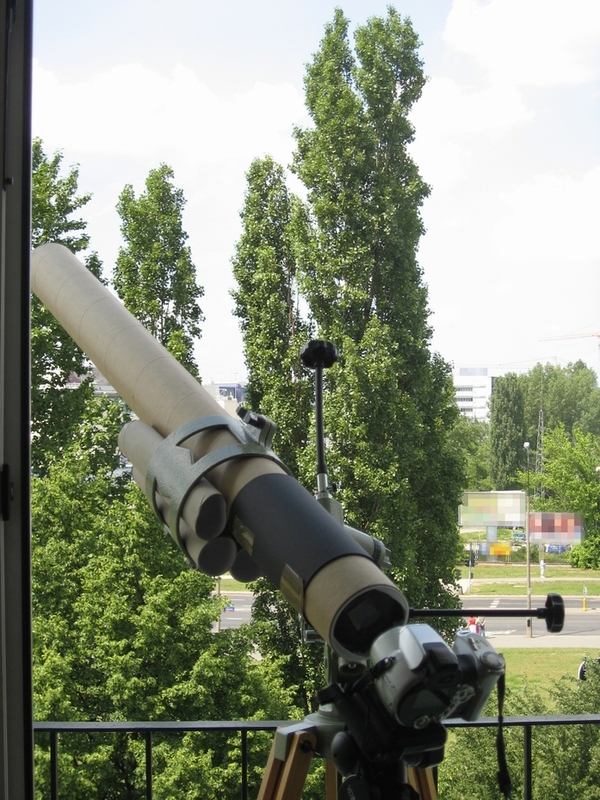 If in a nice, sunny day we point our spectroscope at a clear sky, we shall observe a spectrum of a diffused sunlight. On the continuous spectrum we should clearly see several dark lines. They are absorption lines coming from absorption of light by elements occurring in external layers of the Sun's atmosphere. They are known as Fraunhofer lines, because that is the name of one of their discoverers. It is recommended to cover your eyes/camera with some diaphragm, like the one visible in the photo, a sleeve made from a black cardboard fixed to a spectroscope. It will enable to enhance contrast and will improve spectrum visibility. Can you identify sodium doublet D? These are absorption lines matching emission line of table salt, which have been observed in part II. The last step is to compare your results with the ones of your classmates.